As it has in years past, AT&T is using the Consumer Electronics Show to make its pitch to developers and unveil its plans for the year ahead. This year, much of the focus is going to be on the company’s just-launched LTE network and all of the devices that the company plans to have running on it soon. On Thursday, AT&T announced that it has added service in several more cities, including three of the biggest markets: Los Angeles, New York and the San Francisco Bay Area. In all, the carrier is now in 26 spots, though its network remains far smaller than the LTE footprint of Verizon Wireless. The company has announced several LTE devices, but a bunch more are expected to be shown later on Monday. The most closely watched of these will be a new Nokia device running Microsoft’s Windows Phone, though we’re also expecting to hear from AT&T about other gadgets, including Samsung’s 5-inch Galaxy Note and Sony’s PlayStation Vita. AT&T’s act runs from 9 am to 11 am PT. We’ll spare you a full recitation of the script and instead just offer the Playbill summary, along with insight on the performance and maybe a little inside info about the cast. 8:48 am: The good news: AT&T is passing out 5-Hour Energy bottles, more than enough for its keynote. The bad news: No power outlets. Many in the press row are fretting their laptops won’t have enough juice to make it through. Modem all the way, personally. It’s entertaining, but I’m not sure making people choose between two painful options is the branding message you need, AT&T. 8:55 am: OK, we should be getting started in a few minutes. Going to save laptop juice. By the way, sponsors of AT&T’s developer summit include the expected array of partners — Samsung, HTC, Microsoft — as well as Nokia. Somehow they managed to get RIM to pay twice, as both QNX and BlackBerry are sponsors. 9:03 am: We must be getting close. AT&T just put a slide on the big screen with its SEC-appeasing “safe harbor” warning. Basically, if things change, you can’t say they didn’t warn you. 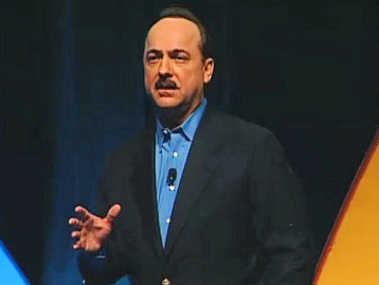 9:08 am: AT&T Mobility CEO Ralph de la Vega takes the stage. Overview so far, no news yet. Expect the new devices toward the end. 9:12 am: Handoff to head marketing guy David Christopher, who is taking a stroll down memory lane, going back 16 years to when the company launched its developer program. I’ll let you know when we get back to the present. 9:13 am: AT&T is announcing a few new programs for developers, including some new programming interfaces to tie into its network. Lots of carriers are doing this and there are benefits to developers that want to do the extra work. The downside is that developers already have to support multiple operating systems and HTML5. For many, writing to each carrier’s developer tools is too much extra work. Among the new APIs, though, is carrier billing for payment — that appeals because it helps developers actually get paid. 9:20 am: AT&T is bringing an interesting developer out — Viva Vision chief and former NFL player Joe Tafoya. Tafoya is showing an app his firm built for Dallas Mavericks player Jason “Jet” Terry. Incidentally, Terry went to high school with our own Tricia Duryee, who is helping out with this live blog, via Webcast. 9:25 am: Some stats on AT&T’s TV product, U-Verse. It’s up to 3.6 million customers, as of last year’s third quarter. 9:31 am: Lots of talk about partners and stuff. Apparently developers have to pay a $99 registration fee and can get unlimited access to the programming interfaces this year. I’m ready for that energy drink. Anyway, now up is Chief Technology Officer John Donovan. He’s talking about the company’s 4G strategy, which includes both its HSPA+ network as well as the LTE network it is just building out now. 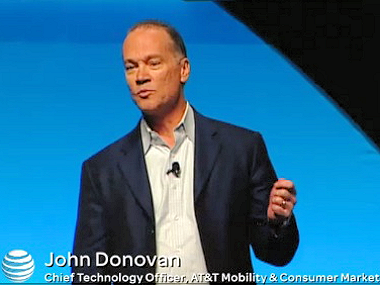 “AT&T delivers the best possible blended speed,” Donovan said, noting this is paying off for iPhone 4S users, since that phone supports HSPA+ but not any other 4G network. 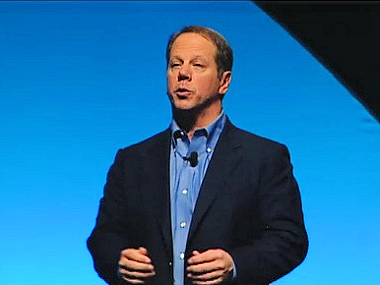 He’s talking about the company’s network investments including 80,000 new antennas and 150,000 network improvements. He’s suggesting the network is going to become like oxygen. Personally, I’m happy that I am able to get oxygen on my own, without having to pay AT&T or rely on them (or anyone else) to deliver it. But that could be just me. And, as Tricia points out, wireless connectivity is inherently more limited than oxygen molecules, which are abundant, even if increasingly in the shape of carbon dioxide. 9:39 am: AT&T also has a cloud strategy, with droplets and other features that I am a little cloudy on. Got distracted by the clouds on the PowerPoint slide, which look like fluffy little pillows to me. Donovan promises the ability to pay hourly or monthly for its cloud services and pledges more news on this front this year. Now he’s talking more about programming interfaces. Developers do care about this stuff, but pretty sure they are all here or watching the Webcast. So I will spare you most of the details. Donovan said the company expects to see 10 billion calls to its interfaces this year, more than double what it saw in 2011. 9:47 am: Pretty sure we will get some new devices at some point. But sadly that point is not now. 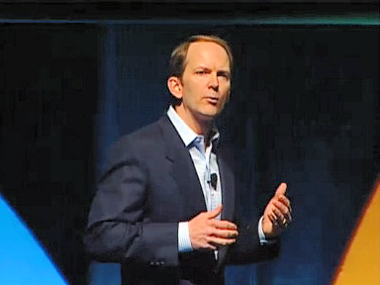 9:52 am: Promising sign — now up is Senior VP Jeff Bradley who heads AT&T’s device business. Still a bit away from the device news. AT&T is talking about a technology for developers designed to allow their apps to be more power and bandwidth efficient. 10:08 am: Zynga and Pandora talking about how that tech helps their apps be smarter about when and how to connect to the network. The tool also works across other devices and networks, Zynga noted. And, Bradley said, it will be made available as open source code later this year. 10:11 am: And, just ahead of the device news, AT&T is talking about AppCenter — its new tool for app discovery. It’s more of a magazine pointing to existing app stores and mobile Web sites than yet another marketplace. 10:12 am: Back on stage are David Christopher and John Donovan. They are talking about three apps created in last night’s hackathon. It’s similar to what AT&T does at its foundries, but this time live. The winner gets backstage passes to AT&T’s concert with Nickelback as well as the opportunity to be featured in an AT&T ad. First up is Action X-Ray, which lets you share your extreme sports injuries with friends. It’s really good for targeted ads. Say, if you have a head injury, you get an ad for a helmet. Next is HopiChest, a health-tracking app for kids to enter stats about their exercise and health habits and tweet it to their friends. Finally is Sleepbot, which is a mobile and web app designed to help users get a better night’s sleep and compare one’s sleep with others who are tracking their Zzzzzs. Now the audience is being asked to vote by text message for a winner. 10:19 am: AT&T isn’t the only carrier making news at CES today, by the way. Verizon has just announced the Verizon Jetpack, a new hotspot from ZTE and a new phone from LG. 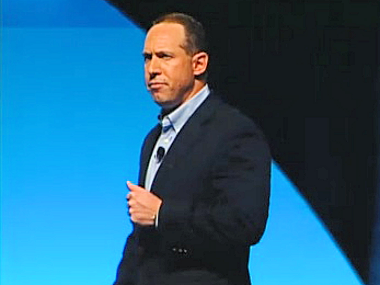 10:22 am: AT&T is ready to start with its device news as well, with emerging devices head Glenn Lurie on stage. First up is gaming and Sony’s PlayStation Vita. AT&T has already said it will have the wirelessly connected game console (an announcement made almost a year ago). It will debut next month. Now it is sharing the fine print. Sony’s SVP Kuni Suzuki is out, but decides to talk first about Sony’s Tablet P, a dual-screen clamshell device that folds out into a tablet-size screen. Sony announced the device last year and said it would come to AT&T, but again, we’ve been waiting on final details like price and availability. 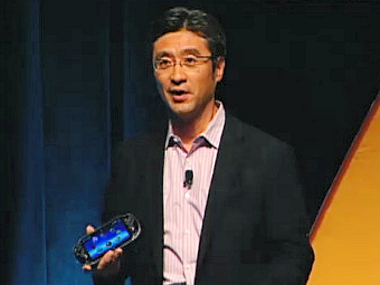 10:30 am: Now he’s showing off the PS Vita, which is already on sale in Japan, Hong Kong and Taiwan. He’s showing pictures of the long lines that accompanied the launch. However, after a strong initial burst, sales trailed off. The Vita is coming to the U.S. on Feb. 22, by the way. Data plans for the Vita will be similar to the iPad, AT&T announced. For $15 a month, gamers will get 250 MB of data and for $25 a month, they will get 2GB. However, since the Vita is a designated gaming device, it will be interesting to see if consumers will be willing to pay just as much for wireless connectivity. The device itself will cost $299. Action X-Ray, the one that lets you share your injuries with friends. 10:40 am: Device time, starting with six new Android devices, all with LTE. Sony Xperia Ion, an exclusive to AT&T, will pack a 12 megapixel camera and a 4.6-inch screen. Planned for second quarter (with Sony branding now that it has bought out Ericsson). Samsung Galaxy S II Skyrocket HD adds a bigger 4.6-inch Super AMOLED screen to the current Skyrocket model as well as a removable battery. Also, as widely leaked, AT&T is getting the Galaxy Note, a 5-inch cross between phone and tablet. W.P. Hong, Samsung’s head of global product strategy, comes out to explain why we actually need such a thing. It’s coming to the U.S. exclusively with AT&T and comes in blue and white. U.S. head Kevin Packingham is brought out to add to the Galaxy Note pitch. He touts the pressure-sensitive pen capability, 5.3-inch screen and other features. “And yes, it does make phone calls,” Packingham said. De la Vega says AT&T also wants to bring LTE to the masses and is doing so with a lower-end LTE phone and tablet from Pantech as well as entry-level phone from Samsung. 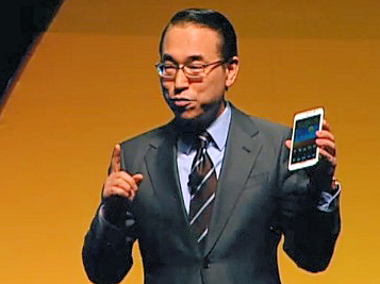 The tablet, the Element, is also waterproof, notes Pantech marketing chief S. Jay Yim, who is now on stage. Yim ends his talk by dipping the tablet in water, with de la Vega handing him a towel to dry off himself — and the tablet. The Samsung Exhilarate, an eco-friendly budget LTE phone, will also be priced at less than $50, AT&T said. 10:57 am: OK, Windows Phone time, with de la Vega saying it sees a lot of promise in the platform. AT&T has been the biggest backer of the technology. AT&T will be first with LTE Windows Phones. And, out comes CEO Steve Ballmer. Ballmer draws a contrast between Windows Phone and its app-centric rivals and says that others’ approach puts distance between a user and what they want to do. “That doesn’t mean we don’t love apps,” Ballmer insists. Microsoft’s approach lets apps work together more easily, he said. Ballmer notes that the company now has 50,000 apps in its marketplace, with 300 more coming each day. Ballmer’s also sneaking in a quick pitch for Windows 8. There have been 3 million downloads of the developer preview version of Windows 8, released at the Build conference last fall, Ballmer said. 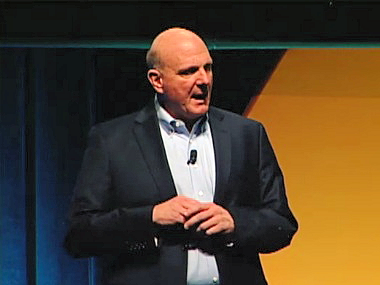 Beta coming in February, Ballmer reminds developers. 11:08 am: On to Windows Phone devices. Nokia is coming, but first up is HTC. 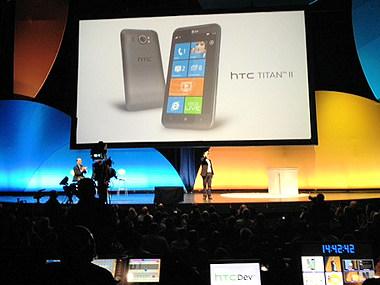 HTC CEO Peter Chou comes on stage to show that company’s first LTE-capable Windows Phone. He shows off HTC Titan II, with its whopping 16 megapixel camera. The press conference is running over and it’s fingernail biting time in the press row as our laptop batteries all dip into the red. 11:15 am: Chou is cracking up Ballmer and de la Vega. Maybe if he keeps it up there won’t be any time for Nokia. 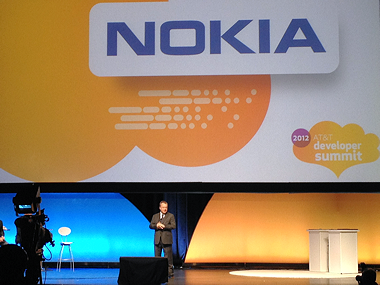 11:16 am: Nope, here’s Nokia CEO Stephen Elop. Elop starts out with his now-familiar line about the battle of devices turning into a war of ecosystems. He also repeats his assertion that Lumia 710 and Lumia 800 were “the first real Windows Phones,” a phrase that is now doubt giving Chou fits backstage. Elop promises first 4G LTE phone will be with AT&T. But he also says that Nokia will share “more details” later this afternoon at its press conference. And with that, the presentation is over.